Is the Bureau of Indian Affairs delaying wind and solar projects? In 2008, the Rosebud Sioux Tribe, in south-central South Dakota, was ready to start developing the 30-megawatt Owl Feather War Bonnet wind farm on tribal lands. The turbines would generate money for the tribe and some of the power would go to homes on the nearly 2-square-mile reservation, covering some of the poorest counties in the country. That’s a big deal considering that homes on reservations are ten times more likely to have no access to electricity than households in non-Indian communities. But even the Rosebud Sioux ran into a roadblock: the Bureau of Indian Affairs. The BIA took a long 18 months, starting in 2008, to approve a lease for the Rosebud Sioux’s wind farm. The delay lasted so long that two agreements with regional utilities who had agreed to purchase the wind power expired before the BIA issued its decision. Years later, the tribe is still hammering out the same details and waiting to build its wind farm. “We haven’t given up on it yet,” said Ronald Neiss, president of the Rosebud Sioux Tribal Utility Commission. The Rosebud Sioux isn’t the only tribe struggling with the BIA and energy development. Tribal lands cover 5 percent of the U.S. land base but account for 10 percent of the nation’s renewable energy potential. Yet, while developers have built 686 utility-scale wind farms and 787 utility-scale solar arrays on non-tribal lands since 2004, only one significant wind project is generating power from tribal lands. 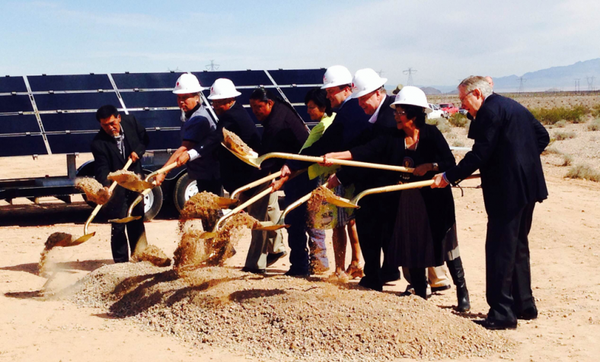 (Another tribal wind farm and a solar project are now under construction, too.) Critics have largely assigned blame to the BIA, saying the agency adds an extra layer of bureaucracy and a measure of ineptitude to already-complex permitting processes. "BIA does not have comprehensive data to identify ownership and resources available for development, does not have a documented process or data to track and monitor its review and response times, and some offices do not have the skills or adequate staff resources to effectively review energy-related documents." The GAO also pointed out the BIA's lack of transparency and use of incomplete, outdated and incorrect property data and other files to complete its reviews. “These shortcomings can increase costs and project development times, resulting in missed development opportunities, lost revenue, and jeopardized viability of projects,” the report says. BIA mismanagement has also encouraged energy companies to pursue coal, oil and gas development on non-Indian lands instead of tribal lands. Of course, building large energy projects and getting regulatory approval isn’t easy to begin with. Many tribes have limited investment funds, minimal infrastructure and additional taxes that already complicate projects. And reservations, with a mosaic of trust lands and individually- or family-owned parcels, also present complex situations for plotting large development. For instance, many reservations have “fractionated” parcels where dozens and sometimes hundreds of relatives own a share of an ancestor’s land, making management decisions nearly impossible. “You have these multiple overlapping historical factors on Indian lands, and energy development is one of these things where having contiguous, abutting parcels of land is really important,” said Eric Henson, senior vice president with Compass Lexecon, an economic consulting firm, and a research affiliate with the Harvard Project on American Indian Economic Development. The BIA isn’t the only agency responsible for the additional challenges on tribal lands, but Henson, the GAO, and others say the agency is hindering rather than helping the situation. “Why does the BIA have to sign off on where you’re going to park a wind turbine anyway? It’s a historical holdover,” Henson said. The Department of Energy or other Department of Interior agencies are better equipped to consult on and approve tribal projects. The White House has tried to address the tribal energy logjam by awarding millions of dollars in federal grants for renewable energy, hydropower, and fossil fuel projects on tribal lands. The BIA has also identified 25 tribal renewable energy projects that could be completed within the next five years and produce up to 2,200 megawatts of power. The GAO report recommends the BIA establish a documented and transparent process for reviewing and responding to projects and improves its data collection and tracking. This week, during a speech to the National Congress of American Indians in Minnesota, Rep. Raúl Grijalva, D-Arizona, also said Congress needs to help address tribes’ qualms and figure out how to get tribal renewable projects in motion. In 2005, Congress authorized Tribal Energy Resource Agreements, to be administered by the BIA, to ease tribes’ efforts to enter power purchase deals and leases. But not a single tribe has used the process because the agreements don’t clearly outline where tribal and BIA responsibilities begin and end.